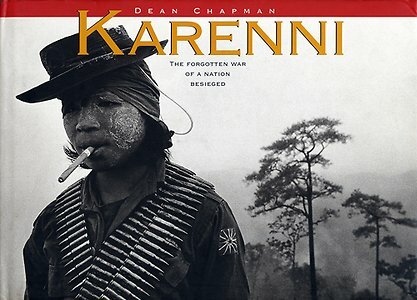 The Karenni have been waging a war of resistance ever since Burmese forces invaded Karenni State on August 9th, 1948. 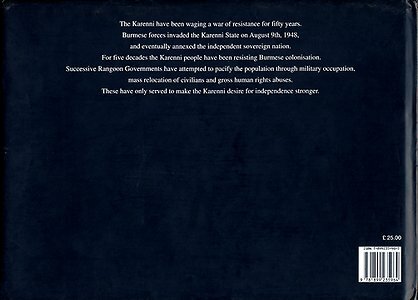 For over six decades the Karenni people have been resisting Burmese colonization, as successive regimes have attempted to pacify and assimilate through a brutal military occupation, mass relocations and gross human rights abuses. Karenni State is the smallest of Burma's seven states and seven divisions. The Karenni is bordered by Thailand to east, Shan State to the north, and Kawthoolei (the Karen State of Burma) to the west. Karenni State covers around 11,670 sq. km, a territory slightly larger than Lebanon. 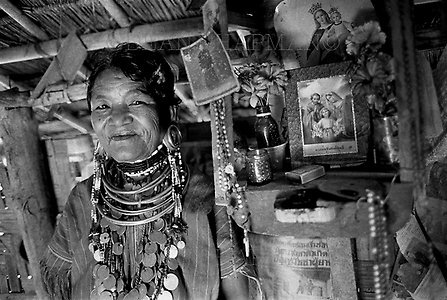 Mae Hong Son Province, Thailand - K'Raw Leh refugee camp, home to thousands of Karenni refugees. Reading the bones. A village shaman inserts bamboo splints into tiny holes along the thighbone of a chicken. The alignment of the splints may give the shaman answers to questions that he has called on the spirits to answer. The rooster was killed by asphyxiation. 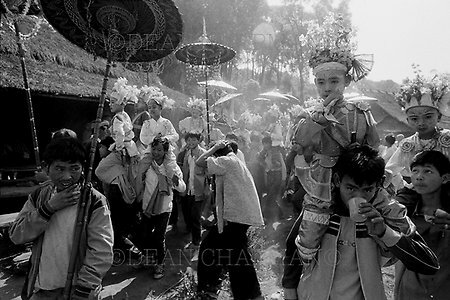 Such sacrifices and predictions occur at all Karenni animist festivals, celebrations, funerals, or when a person needs to consult the spirits. 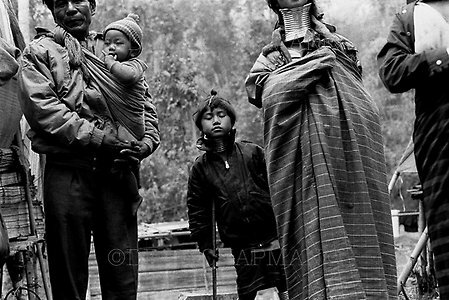 Ethnic Kayah victims of forced relocation by the Burma Army arriving in Thailand. They have chosen to flee to established refugee camps rather than be forced, often at gunpoint, into the camps established by Rangoon's troops. The Burma Army burned the abandoned villages, destroyed rice stores and paddy, and shot dead livestock of those who fled to Thailand. Karenni Army soldiers heading for deployment around the Karenni capital, Loikaw. Karenni forces have been resisting Rangoon/Naypyidaw's authority, and occupation by its troops and allies, for over sixty years. A lull in an artillery barrage. A Karenni guerrilla and medic staring from a bunker, anticipating the Burma Army's impending ground offensive during the second battle for Ember Hill, Karenni. Early morning. A 120mm mortar shell explodes at the beginning of the second battle for Ember Hill. 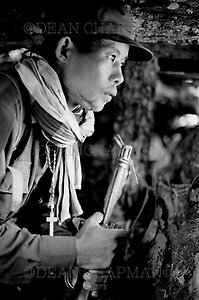 The All Burma Students' Democratic Front (ABSDF) soldier was one of four young men who joined the student army after being forced to porter for the Burma Army. They escaped by fleeing across minefields. 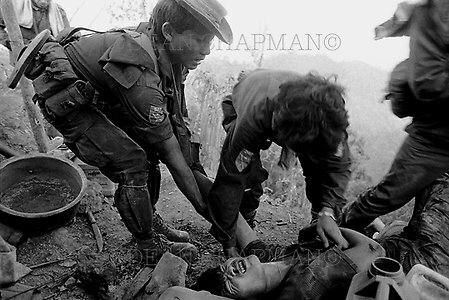 This combatant was later killed in action, fighting soldiers of the Karenni National People's Liberation Front (KNPLF). The KNPLF split from the Karenni National Progressive Party (KNPP) in 1978 and signed a cease-fire agreement with the dictatorship in May 1994, since when it has fought alongside the Burma Army against pro-democracy forces. 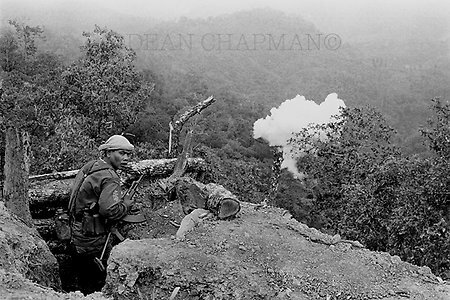 Karenni Regular Guerrilla Forces combatant Antonio taking cover in a trench as Burma Army mortar shells rain down on the hilltop fortification. 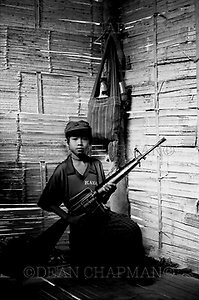 The 13-year old Karenni fighter joined the Karenni resistance after his family and fellow villagers were about to be forcibly moved to a relocation camp controlled by the Burma Army. 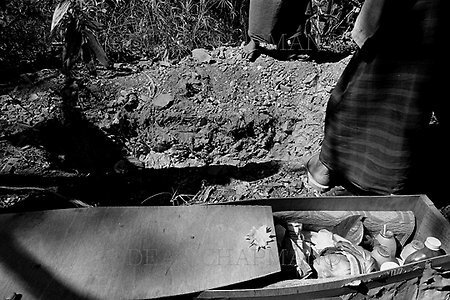 Antonio claimed to have killed at least six Burma Army soldiers during the fighting for Ember Hill. An All Burma Students' Democratic Front (ABSDF) combatant is hit in the back by shrapnel from a 120mm mortar shell. He had noticed Burma Army troops closing in on the hilltop position and opened fire. A mortar shell slammed in behind him, smashing an inch-long shard of metal into one of his lungs. After four days of intense fighting, Karenni and All Burma Students' Democratic Front (ABSDF) combatants abandoned Ember Hill after running out of ammunition. 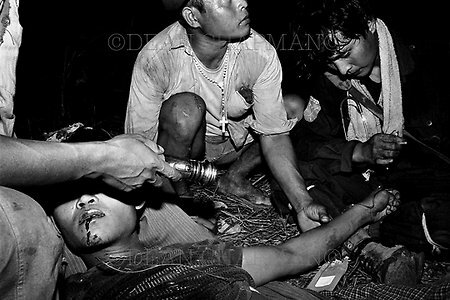 A seriously wounded All Burma Students' Democratic Front (ABSDF) soldier being evacuated from the frontline during the second battle for Ember Hill. 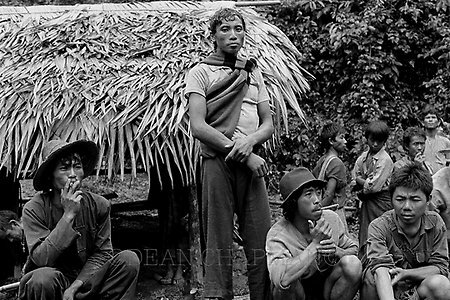 Karenni guerrillas in a rest camp having just returned from the frontline. Ethnic Kayaw women attending a ceremony to mark the Thai Queen's birthday. The ceremony was conducted by Karenni officials as a way of thanking Thailand for the refuge given to Karenni refugees in Thailand. 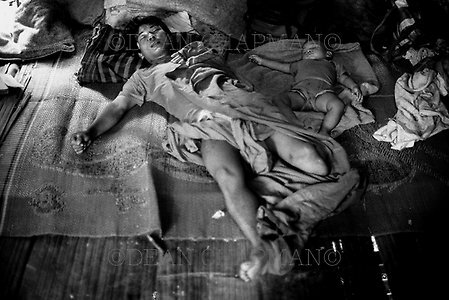 A Kayan man sleeping alongside his baby daughter, after mourning the death of his stepson. The teenager had been hunting in the forest inside Karenni when he stepped on a landmine. Badly injured, he put the barrel of his rifle into his mouth and pulled the trigger. His hunting companion heard an explosion and then a bang. The sleeping Kayan man had lost his leg after standing on a landmine a year previously. K'Raw Leh clinic. Karenni medics attending to a pregnant Kayah woman who has just been carried into Thailand suffering from exhaustion and possibly malaria. She has fled to Thailand becuase of forced relocation by the Burma Army in Shadaw Township, as the soldiers tried to stem support for Karenni insurgents by targeting civilians. Pai River. 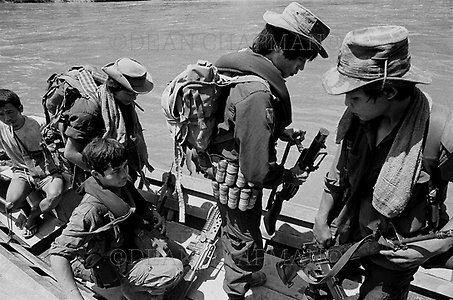 Karenni Army soldiers leaving for the frontline in a long-tail boat. Fighting rages several miles down river as the Burma Army tries to recapture a remote outpost recently overrun by Karenni forces. 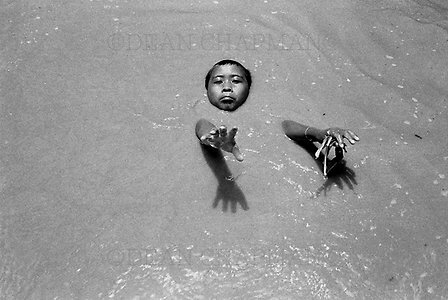 An ethnic Kayan boy swimming in floodwaters. Hot season. 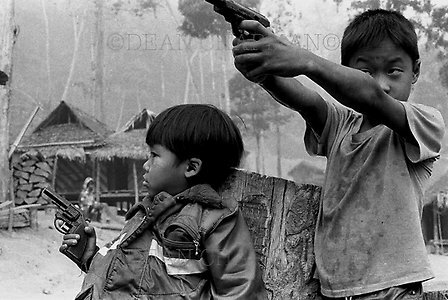 Kayan boys playing at war with water pistols. Kayaw mother and boys. 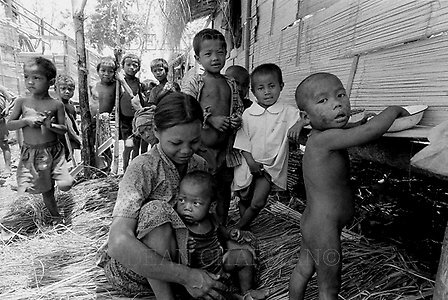 Over a thousand ethnic Kayaw refugees fled to Thailand after the threat of forced relocation by the Burma Army. Another eight thousand remote villagers were relocated, often at gunpoint, into detention camps in western Karenni State, controlled by the Burma Army. The majority of those uprooted were Roman Catholics. An ethnic Kayan girl cooling herself in the receding waters of a flash flood. 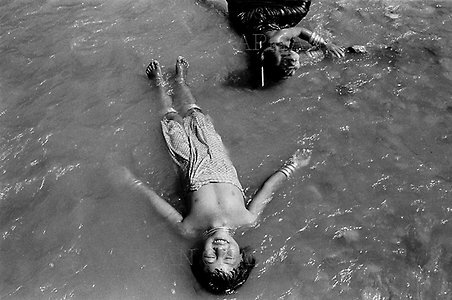 Kayan children bathing in the Pai River. Kayan girls playing in the receding waters of a flash flood. Ethnic Kayan sisters washing at the camp spring early in the morning. 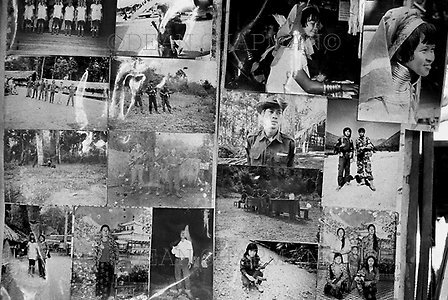 Photographs in the home of a Kayan family. 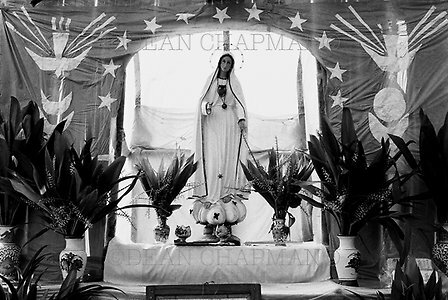 A Kayaw grandmother standing next to the Roman Catholic shrine in her home. She 'works' for the Karenni Culture Ministry in a village established for foreign tourists. 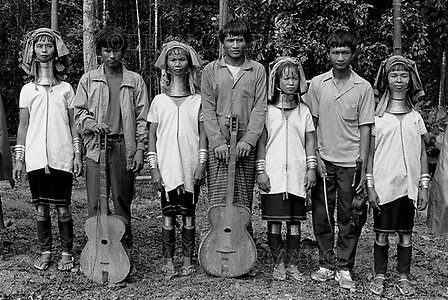 As the Kayan are often referred to as the 'long-neck,' Thai guides have dubbed the Kayaw women the 'long-ears'. 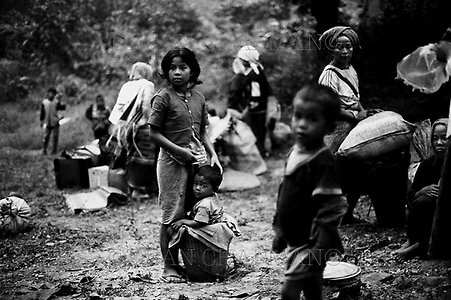 The woman fled to Thailand, fleeing forced relocation of her village in western Karenni State by the Burma Army. 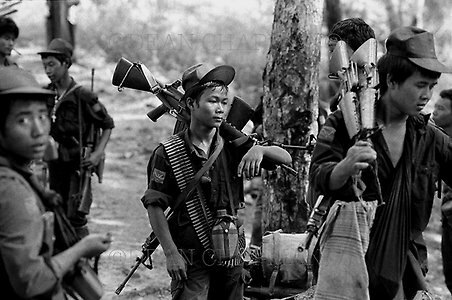 Exhausted Karenni Army trainees returning from the frontline, carrying weapons from an arms cache threatened with capture by advancing Burma Army troops. 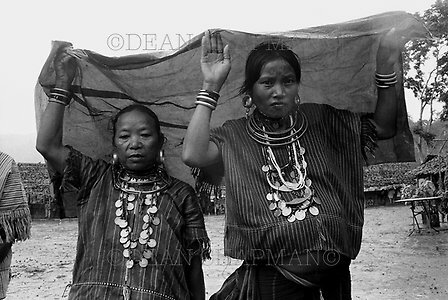 Kayan men and women attending the ceremony marking the 44th anniversary of Karenni Armed Forces Day; 17th August 1992. Tanna Kwei Point. 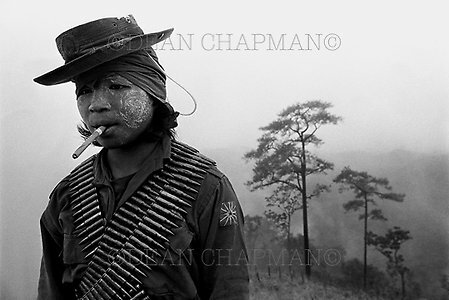 A Karenni soldier awaiting an impending Burma Army offensive. Scattered around the position are the decomposing corpses of scores of dead Burma Army soldiers who failed to capture the position three weeks previously. The wind reeks with the gagging stench of death. The soldier was shot in the shoulder during the offensive that followed. 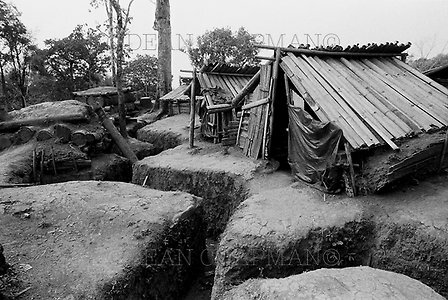 The Burma Army eventually overran the fortification, but not before sustaining hundreds of casualties. This soldier eventually left the Karenni Army and returned to farming in his home village in an area controlled by Rangoon's forces. The farmer was subsequently arrested by Burma Army troops, taken to an Army base, and tortured to death. 8th August 1996. The 8th anniversary of the slaughter of thousands of civilians by Burma's military dictatorship following the popular pro-democracy uprising across the Union. 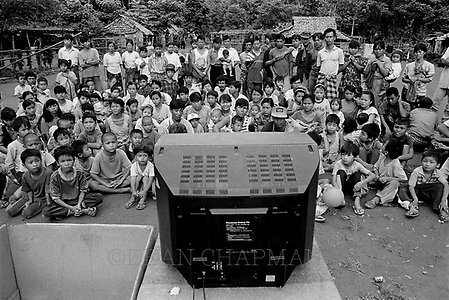 All Burma Students' Democratic Front (ABSDF) and Karenni families about to watch a war movie, following a ceremony to remember those who have laid down their lives in the pursuit of democracy. 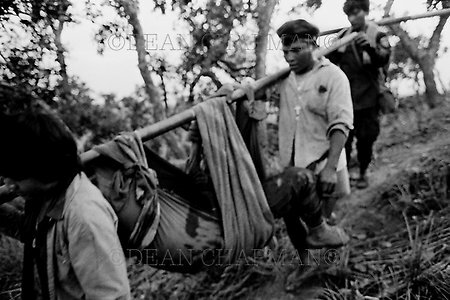 Shan men relaxing having escaped detention by the Burma Army. Forced at gunpoint to carry munitions to the frontline, these men had been away from their homes for two to three months. 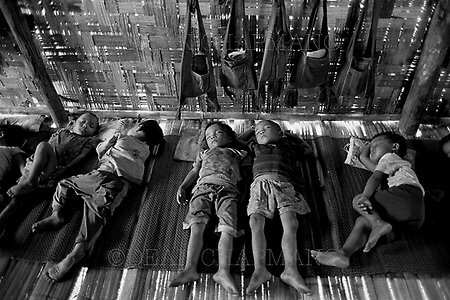 They escaped captivity by crossing Karenni minefields under the cover of darkness. One Karenni officer joked that they must have been 'walking with angels' to have come through unscathed. 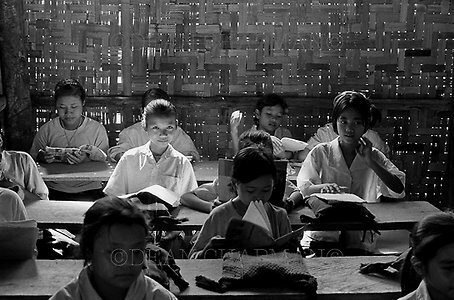 5th grade girls studying at the Karenni Government High School. Subjects then studied included the Kayah, English and Burmese languages, mathematics, geography, history and science. Instruction depends on the availability of teachers and funding. 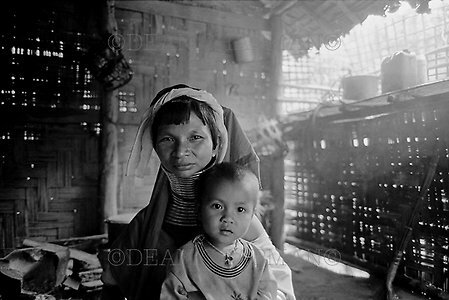 An ethnic Kayan mother with one of her five daughters, in their family kitchen. 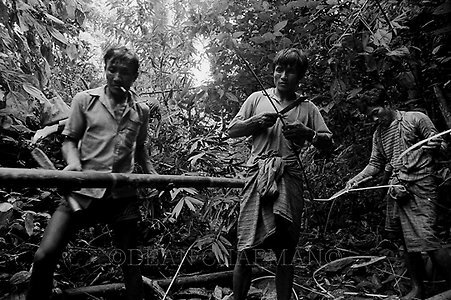 Kayan men cutting bamboo for the construction of a house, which is being constructed by all the men of the Kayan village section. 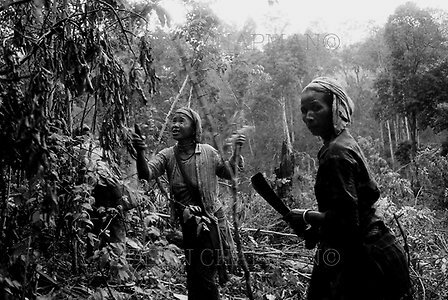 Ethnic Kayah women making a little money by clearing away the undergrowth for a teak plantation, planned and financed by the Thai Ministry for Forests. Shin Pyu festival. 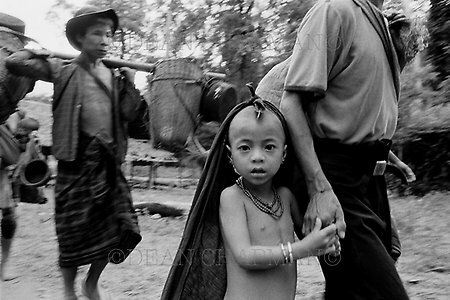 Ethnic Shan and Pa-O boys are carried around the refugee camp prior to the novitiation ceremony, when the boys become novice Buddhist monks. The celebrations leading up to the ceremony lasted for four days and four nights. 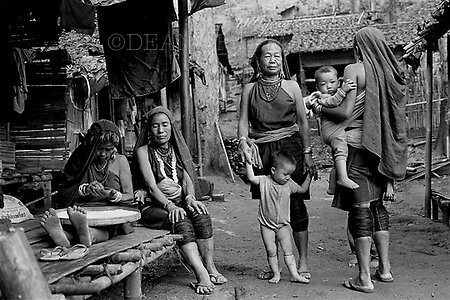 Kayah women and children adapting to a life in a refugee camp after fleeing forced relocation by the Burmese authorities. The Burma Army burned their village as punishment for fleeing to Thailand. 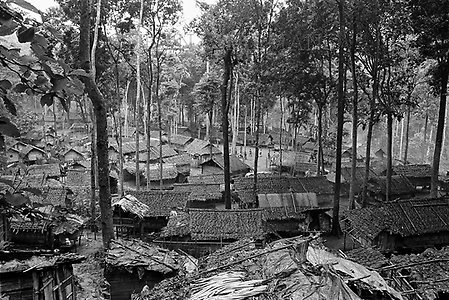 The Thai authorities are reluctant to allow foreigners access to this camp which is close to the Karenni frontier and Burma Army fortifications. Many refugees live in fear of one day being forcibly repatriated back to Burma. 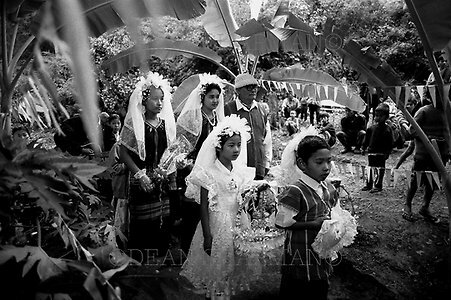 A Karen Baptist wedding, shortly before the refugee camp was relocated by the Thai authorities. 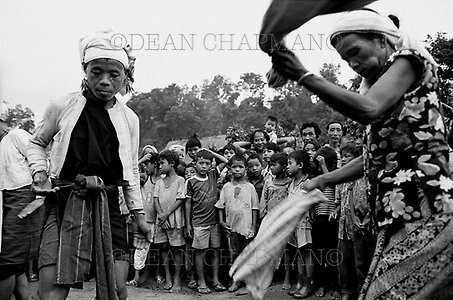 An ethnic Kayah man [left] dressed as a woman, dancing during the Di Khu Pwae (sticky rice) festival. The festival is held in August or September depending on the spirits, and celebrates the planting of the rice paddy. Sprits dancing, playing and teasing during the Di Khu Pwae (sticky rice) festival. The festival is held in August or September depending on the spirits, and celebrates the planting of the rice paddy. A Kayan woman washing in the Pai River. Kayan family eating lunch in their kitchen. The adults are drinking home-made rice whisky. 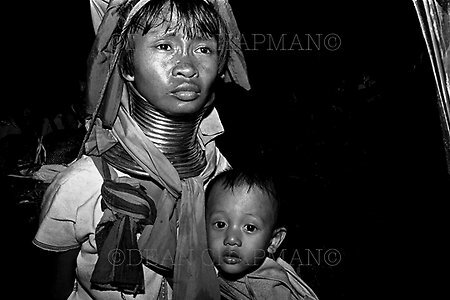 An ethnic Kayan woman breast-feeding her baby son. 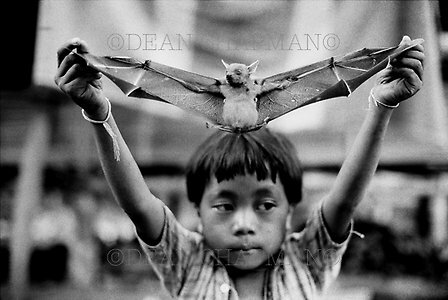 A Kayan boy with dinner; a bat shot by his father with an ancient musket. Butchering a dog for dinner. 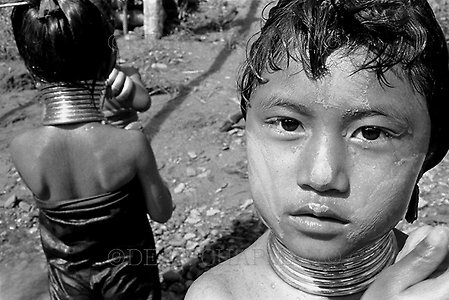 Traditionally, the Kayan believe that they must eat dog meat once in the cold season for medicinal purposes. 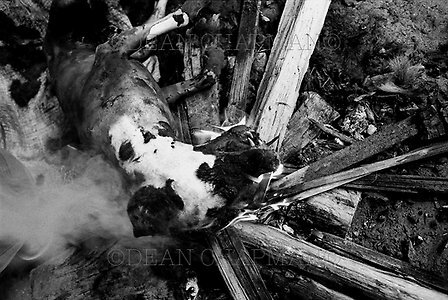 The dogs are beaten to death. The meat is often minced then mixed with chillies and stuffed into the washed intestines to make sausages. Many Kayan choose not to eat snake or frog meat as they regard the animals as dirty, because they live on the ground. 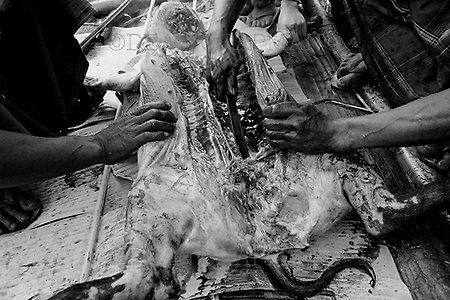 Butchering a pig. 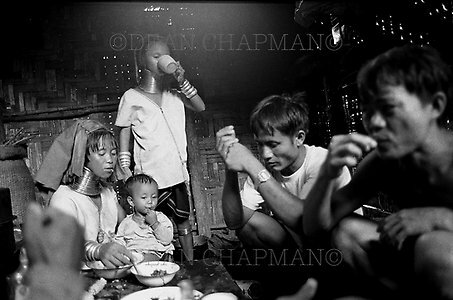 A Kayan child has died from malaria and a meal is being prepared for the wake of the child. The pig's head was left on top of the child's grave after an animist burial. Monkey meat for sale. 80 baht per monkey ($3). 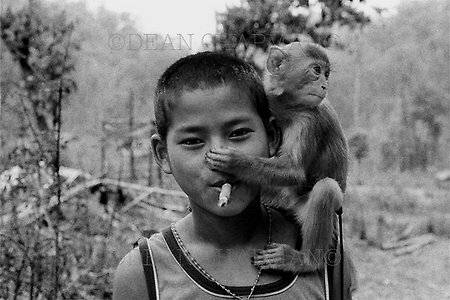 A 15 year-old Karenni Army trainee with his pet monkey. 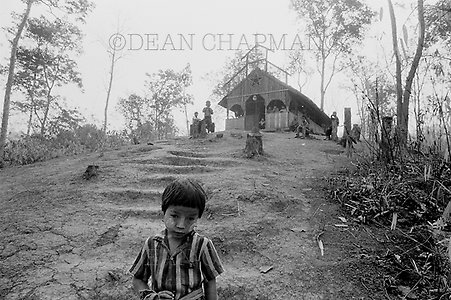 Na Lone Checkpoint, a Karenni position a mile from the Thai frontier. Christmas at a temporary Catholic Church. Children standing in front of their home. Easter at the Roman Catholic Church, children waiting for the service to begin. 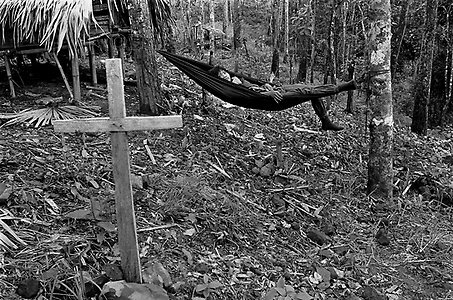 A Karenni guerrilla relaxes in a cemetery on Rambo Hill. Ember Hill. 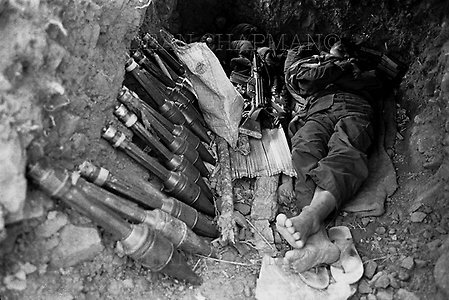 A Karenni guerrilla sleeping in a bunker with a Burma Army machine gun and Chinese-made rocket propelled grenades. Point Five Hill (so-called because of the heavy machine gun positioned on the fortification). 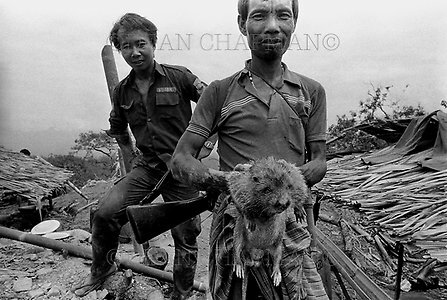 Karenni soldiers with dinner - a bamboo rat. Prisoners of War. 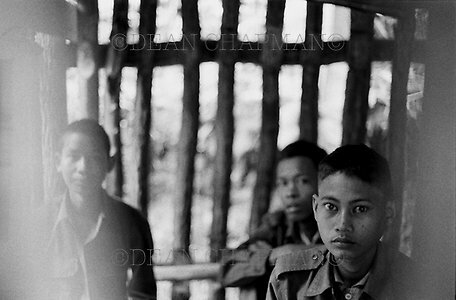 Burma Army soldiers captured when Karenni forces overran their outposts close to the Thai frontier. Twenty seven Burma Army soldiers were captured. Thirteen survived. Of those, four decided to join the Karenni Army while nine others were repatriated by a Thai NGO. 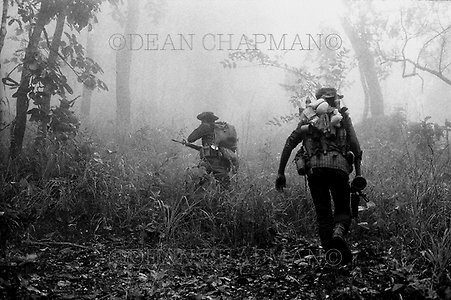 When Burma Army troops re-entered their outposts dozens lost legs after standing on landmines, or were injured by booby traps left by Karenni forces. A Karenni Army training camp. 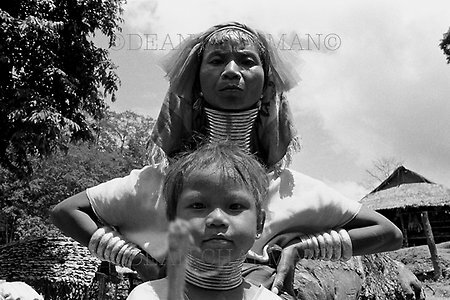 A Kayan mother with her youngest daughter. 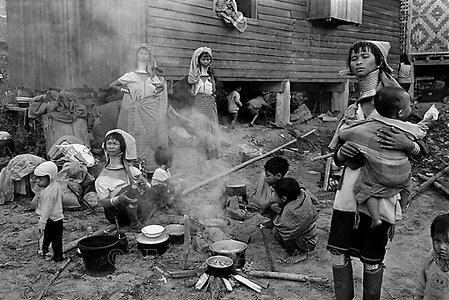 Kayan women cooking breakfast the morning after fleeing deeper into Thailand from their homes in a refugee camp closer to the frontier because of fighting along the Thailand/Burma border and the threat of further shelling of the refugee camps by the Burma Army. Amputees at a workshop making artificial limbs for themselves. 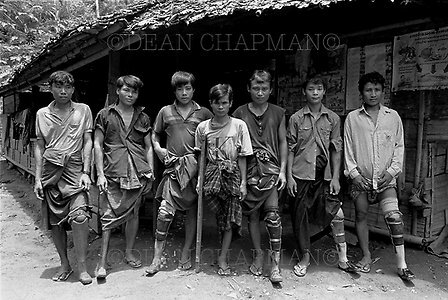 All but the man on the crutch were Karenni combatants and some lost limbs after standing on mines laid by Karenni forces. Afternoon rest. 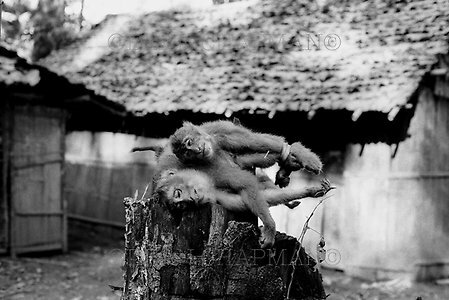 Identical twins sleeping in a Karenni Government nursery. Hot season. Early morning. 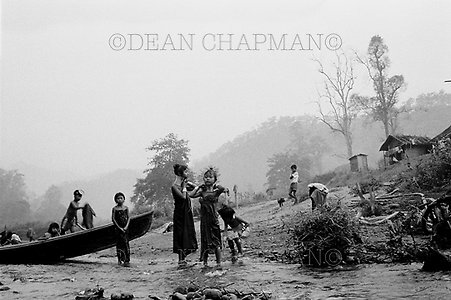 Kayan girls washing in the Pai River. A Kayan woman enduring a sauna as a means of cleansing her body after giving birth. The sauna lasted for three days, during which time her amputee husband heated rocks on an open fire. The rocks were placed beneath the woman who would pour cold water on them. A cold season's morning. 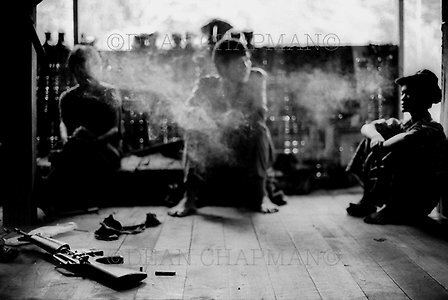 A Kayan family warming themselves around an open fire. 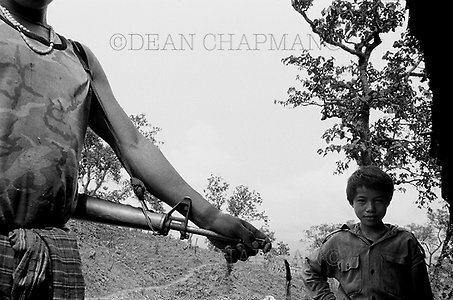 A 9 year-old Karenni Army volunteer trainee with an M16. Kayan mother and son fleeing further into Thailand because of a Burma Army offensive spilling over the border onto Thai territory, threatening the security of the refugee camps. The Burma Army were firing mortar shells a the insurgent fortifications, and at refugee camps on Thai territory. An All Burma Students' Democratic Front (ABSDF) medic monitoring the intravenous drip given to a wounded student comrade who is being evacuated from the frontline having been wounded in the back by shrapnel from a 120mm mortar shell. 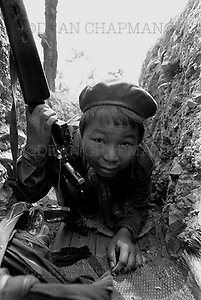 The student had noticed Burma Army troops closing in on the hilltop fortification and had opened fire on the enemy when a mortar shell exploded nearby, behind his position in the trenches. Rambo Hill. 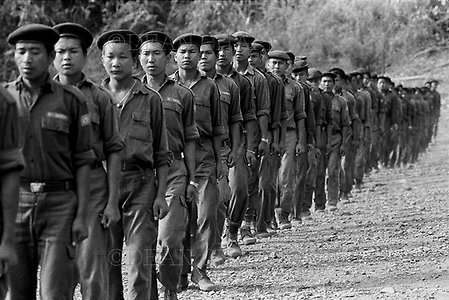 Young Karenni Army trainees. Early morning. 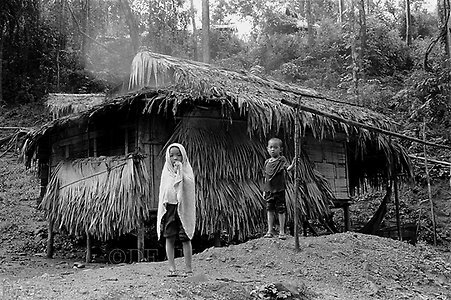 Kayaw refugees waking after spending the night sleeping rough in the forest. The previous day mortar shells fired by the Burma Army during their offensive to capture the Ember Hill area began to land in Karenni refugee camps along the Thai border, forcing refugees to flee further into Thailand. A malnourished ethnic Kayaw child suffering from malaria and running a dangerously high temperature, is cooled using water poured from a watering can over a towel. The clinic had no medication to prescribe to the child. His family had fled forced relocation by the Burma Army, choosing to seek refuge in Thailand rather than be interned in what locals called 'concentration camps' - located next to Burma Army installations where villagers were regularly forced to work unpaid for the military. 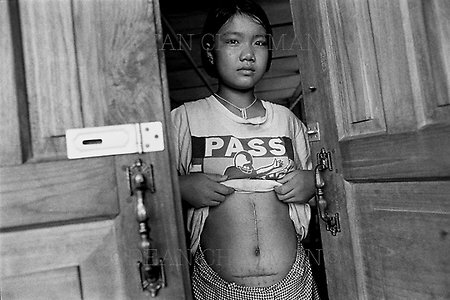 The 11 year-old daughter of the Karenni Religious Affairs Minister displaying the scars from operations she underwent after being shot through the stomach in a failed assassination attempt on her father's life by Burmese agents inside Thailand. 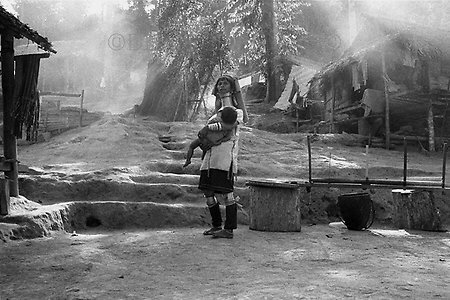 A Kayaw boy with a clubfoot being helped to walk by his mother. His mother died shortly afterwards and his brother was left to look after the handicapped child. They were subsequently adopted by another family. A partially blind and severely malnourished 4 year-old girl in a Karenni Government clinic, with her older sister. 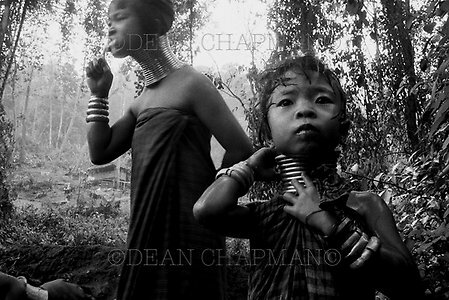 The two had just arrived in the refugee camp having fled forced relocation by the Burma Army in Shadaw Township. Cold season. Sunlight burning through morning fog. 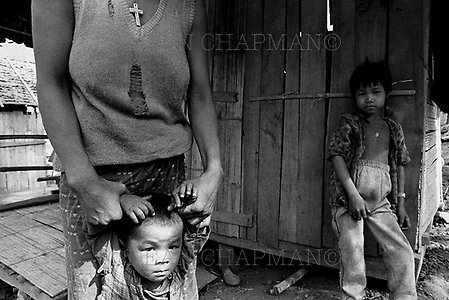 A Kayan woman carries her sick daughter, shortly before the child died from cerebral malaria. Rambo Hill. 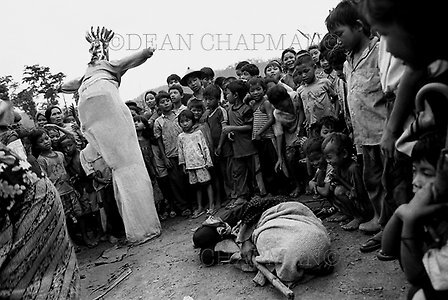 The animist burial of a Kayan child who died from malaria. Sunset. Ember Hill. 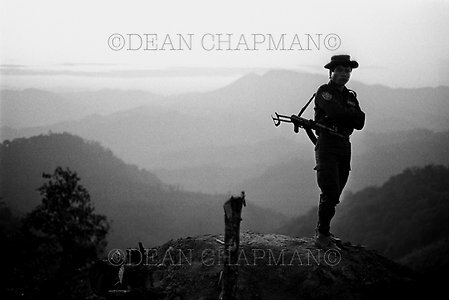 An All Burma Students' Democratic Front (ABSDF) soldier standing guard on a bunker in front of Elephant Mountain. Another Burma Army offensive is expected at any time.